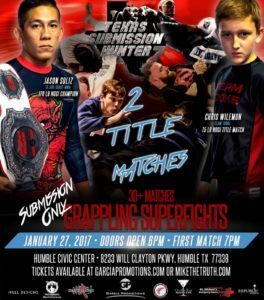 Garcia Promotions returns to the Humble Civic Center on January 27, for Texas Submission Hunter 7. The super fights grappling card will feature 30+ matches, including 2 title matches. Jason Soliz will defend his 170lb nogi title against Renan Chavez, and Angel Brewer will face Chris Wilemon for the inaugural 75lb Kids Title. Check out the card below. You can purchase your Texas Submission Hunter tickets here at MikeTheTruth.com. Who won fight of the night and submission of the night January 27 in Humble?